I am happy to announce that the Brown Library (Washington, NC) website now offers kids a chance to enjoy a video clip story! Each month I will read a favorite a book or tell a story. Sometimes there might be puppets or illustrations to accompany the book. 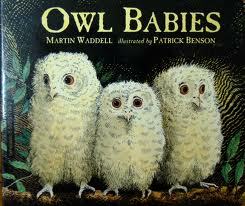 This month's story -- our first -- is one of my favorites, "Owl Babies", by Martin Waddell. Simply put the library's website address in your browser bar or click this link: www.youseemore.com/brown . Once there, click on Children's Services, followed by Enjoy a Story! A big shout out to Elizabeth at the Brown Library for all of her amazing help with this feature!